Originally published under the title, "Garland Shooting: The Jihad Against Free Speech Comes to Texas." We are living in infamous times. Reality outpaces fiction, and the worst case scenarios keep unfolding in our daily headlines. Critics of torturers and mass murderers are demonized as "extremists" and "provocateurs." Israel is accused of human rights atrocities it has never committed by those very entities who themselves actually commit such atrocities; anyone who points this out is deemed an "extreme conservative" and a "racist." Anti-infidel hate speech—as long as it is directed against America and Israel—is seen as protected by the First Amendment and by the doctrine of Free Speech; exposing the diabolical big lies is considered politically incorrect "racist" hate speech which has no place in the Western media, on campus, at the UN, or in any international human rights organization. Either the West fights back or it surrenders to these Orwellian rules. Many Western intellectuals prefer scapegoating Israel and surrendering quietly to these diabolical Islamist rules rather than risk their reputations and their lives. Either the West fights back or it surrenders to these Orwellian rules. Some of us fight back. We do so in different ways. Some of us use only our pens. Others launch demonstrations and lawsuits. Some do both—and some push the envelope, looking for certain trouble, welcoming it, in order to provide an object lesson to those who will not see the jihad that is upon us, the jihad that only Israel once faced, the jihad that is destroying the Middle East and the Muslim world. 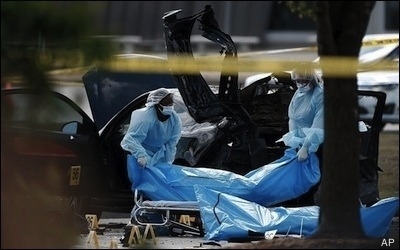 Now jihad just took place in Garland, Texas, a suburb of Dallas, in the United States of America. 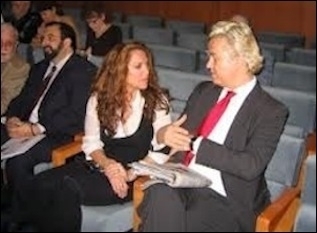 Enter Pamela Geller, the blogger-activist and founder of the American Freedom Defense Initiative (AFDI), Robert Spencer, the best-selling author and founder of Jihad Watch, and Dutch parliamentarian and filmmaker Geert Wilders—all long-time freedom fighters against radical, terrorist Islamism. These three have just joined the august ranks of the publisher of the original Mohammed cartoons and the International and Danish Free Press Societies, not only in terms of their having all been awarded pariah status as "Islamophobes" and "racists," but now in terms of having "provoked" criminal gunfire. The British and American media has identified a suspected former terrorist Elton Simpson as one of the two gunmen who shot an officer protecting the AFDI's Muhammad Art Exhibit and Cartoon Contest award ceremony yesterday. Both gunmen were shot dead and an officer was wounded. The gunmen lived in Phoenix, Arizona and one was on an FBI "No-fly" list. Shortly before the attempted attack, an account believed (though not confirmed) to belong to Simpson tweeted "May Allah accept us as mujahideen." Another tweet, registered to AbuHussainAlBritani reads: "When will the kuffar understand and stop insulting the prophet s.a.w? learn from history & save your people! #Paris #Denmark #Texas." According to the Daily Mail, followers of ISIS had been "calling for an attack online for more than a week after learning about the cartoon contest." This event was a "defiant gesture" in support of Free Speech in the wake of the January massacre of the Charlie Hebdo cartoonists—and, I would add, in the wake of the cowardice of those PEN authors who are protesting the Freedom of Expression Courage award being given to a surviving Charlie Hebdo editor and a cartoonist. Geller wrote on her website, "This is a war. This is war on free speech. What are we going to do? Are we going to surrender to these monsters?" Free speech and, in America, the First Amendment, were crafted to protect all free speech, including that which some people find offensive or even scurrilous. We are not all meant to like or agree with it. This concept is the fruit of centuries of Western-style evolution, something that Islam has never enjoyed. In Islam, "blasphemy" and "apostasy" are viewed as capital offenses. In 1988, when Salman Rushdie published a novel that the Ayatollah Khomeini profoundly disagreed with, the Ayatollah did not write an opposing novel or critique. In 1989, he issued a fatwa calling for Rushdie's death and the Iranian government backed this fatwa through 2005. Rushdie lived in hiding and with police protection. One of Rushdie's translators was murdered, bookstores were firebombed, publishers threatened. Publishers as well as authors began to self-censor. In 2004, Dutch filmmaker Theo van Gogh was butchered by Moroccan-Dutch jihadist Mohammed Bouyeri, who did not like van Gogh's (and Ayaan Hirsi Ali's) filmed critique of Islam's treatment of women. 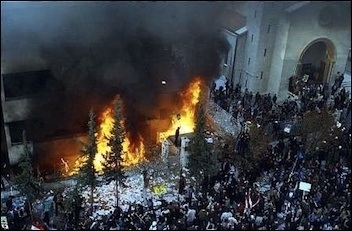 A mob sets fire to a building housing the Danish embassy in Damascus in February 2006, during the Jyllands-Posten Mohammed cartoons controversy. In 2005, Flemming Rose published the original Mohammed cartoons in Jyllands-Posten, the Danish newspaper. These cartoons were relatively tame. Jihadists secretly added some more malicious cartoons to the mix—and sent it around the globe via the internet. Violent and highly choreographed riots ensued around the world. Gunmen in Gaza invaded the EU's offices there demanding an apology. Between 2005-2013, protests spread across the Middle East. Infidel embassies were attacked. Charlie Hebdo republished the cartoons and reaped a whirlwind of lawsuits and attacks. In 2008, the Danish police arrested several suspects who were plotting to kill Kurt Westergaard, the original Mohammed cartoonist. In 2009, Yale University Press published a book about the cartoon controversy by Jytte Klausen. However, without telling the author, the Press removed the actual cartoons from her book. In 2010, a Somali Muslim with an ax and a knife entered Westergaard's house; luckily, Westergaard fought him off. In 2010, American cartoonist Molly Norris proposed an "Everybody Draw Mohammed Day." She published her own rather harmless and funny cartoon. Norris has had to live in hiding ever since. In hiding. In America. In 2011, Charlie Hebdo's offices were burned down in an arson attack the day after they published an issue with the prophet Mohammed as the Editor-in-Chief. In early 2015, jihadists massacred 12 people at the office of Charlie Hebdo in Paris; for good measure, they murdered four Jews two days later. Also in 2015, in Copenhagen, a gunmen opened fire at a debate on Islam and Free Speech. One documentary filmmaker, Finn Noergaard, was shot and three police officers were injured. The shooter, Omar Abdel Hamid el-Hussein, got away and soon after murdered a security guard at a synagogue; he was then killed. Now, jihadists have attacked Free Speech in America. Whether or not people find Geller, Spencer and Wilders "extremely provocative troublemakers" both they and We the People are absolutely entitled under our laws to exercise our First Amendment rights. About anything. We cannot yell "fire" in a crowded theater. Some believe that Geller et al. are doing just that, causing trouble when trouble can be avoided if one only follows Islamist guidelines. Many elitists and scholars favor "nuance," "sensitivity," "anti-racism," "inter-faith dialogue." But they should favor freedom more and double standards less. Westerners have absolutely no trouble criticizing Christianity and Judaism. Why so much angst about criticizing one religion only: Islam? If what Geller, Spencer, and Wilders have just done advances the cause of freedom of speech, we may not all have to follow their tactics, but we should at least acknowledge that we support their goals. If not, what exactly are our alternatives? Phyllis Chesler, an emerita professor of psychology and women's studies and the author of sixteen books, is a Shillman-Ginsburg fellow at the Middle East Forum.